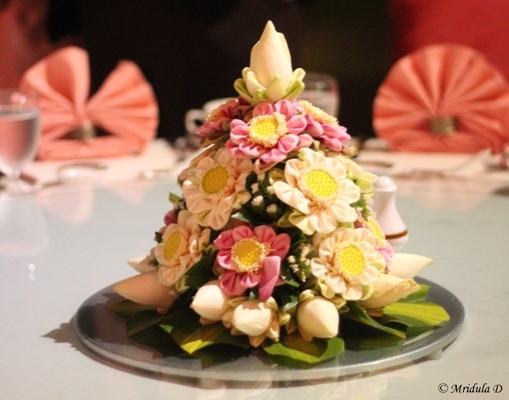 What do you do when you see pretty flowers on your dining table? 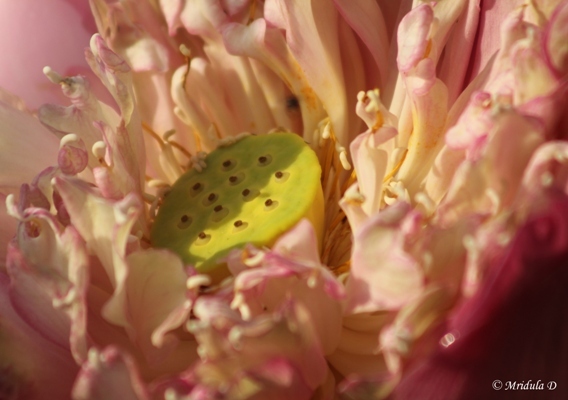 When I saw the bunch that is featuring below we started a discussion, whether the lotus flowers were real or not! 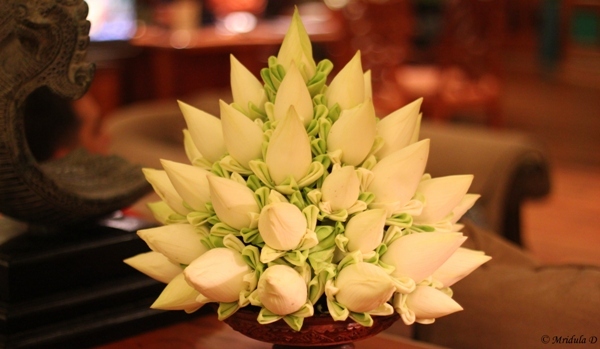 I mean have you seen a lotus flower arrangement like this before? I had not, for sure. Are These Lotus Flowers for Real? My first question to everyone else was if these lotus flowers were for real? We had officials from the Tourism Ministry of Cambodia on our table and they asked me to pull one out and see for myself. I wanted to but I hesitated. I actually wanted to pull one and take it away with me to my hotel room. However, I decided to touch them instead and they were for real. Another person explained that the real flowers are arranged artistically in this fashion! I really liked them. It is the small things like this on my travels that give me so much happiness. 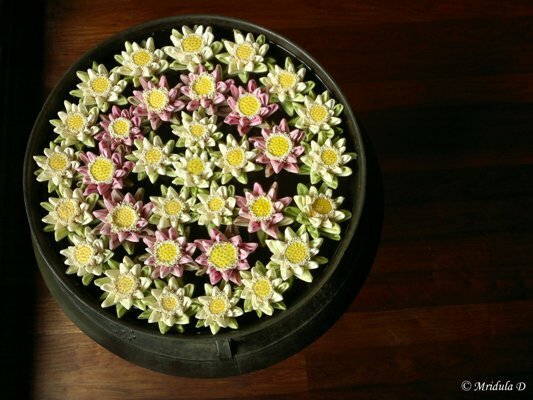 This was the floral arrangement at Sokha Angkor Resort in Siem Reap, the place where I stayed. After orchids, lotus was the other flower that I saw growing almost in every water body that I crossed. At some point I remarked to a person, “they grow here like weeds!” This is true both of Cambodia and Thailand. Not only I saw lotus in hotels, I also saw them growing in ponds. I was able to walk up close to them and click pictures. Lotus stems were also available for sale in markets and I ate a dish which had lotus stem. But one arrangement that clearly took my breath away was this! I had only my cell phone with me. I patiently reviewed all the pictures I took and did not budge till I took the one that satisfied me. This should also go down as note to self– that I should review my pictures more frequently and move on only when I am satisfied with the result! Very lovely set of photos of these flower decorations. Its amazing that they are real too. The flower arrangements are amazing. I didn’t know you could eat the stems, were that good. Barry you can eat the stem after cooking like a vegetable. We do that in India too. There is a herb store nearby, I will have to try some. I can understand your feeling , same thing happened with me when i went to Manali and saw 100’s of Roses on a single plant in every home. It was a sight to view. Tarun thank you for stopping by and reminding me of those beautiful roses. Thank you Harsha. I so wanted to pull a flower and take it to my room! Gorgeous. I agree that it is the small things that make you happy. Wow – these are so gorgeous! The donation widget on your sidebar- somehow gives an impression that you intend to go to Antarctica only in 2041 and not in 2014.. I understand 2041 is a foundation, but readers may not get it quickly..
wow! What lovely arrangements! Each of them different and artistic.